Meatballs in tomato sauce are one of the best known Italian dishes. And who doesn’t love them? 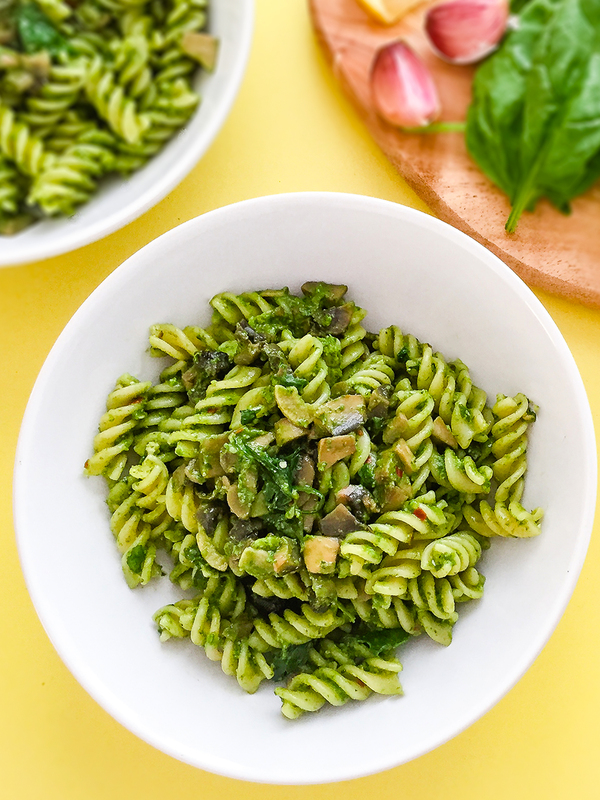 As here at Foodaciously we want everyone to enjoy delicious food without compromise, we have made a healthy version of the traditional meatballs that is also allergen-free. In fact, these meatballs with Mediterranean herbs are dairy-free, gluten-free, and egg-free and made with super nutritious ingredients. For more allergen-friendly recipes, use our Smart Search function, we have loads of useful filters for you. 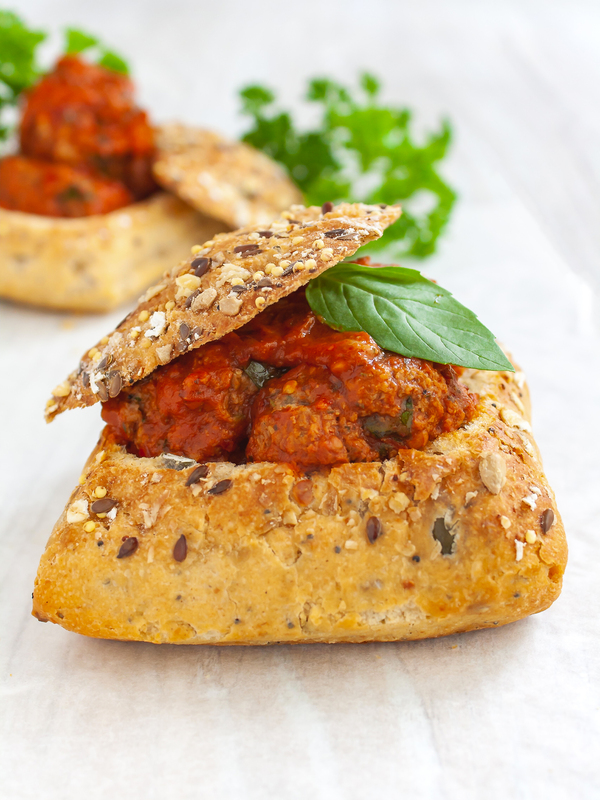 These meatballs are served with a spicy tomato sauce in a crispy bread bowl. 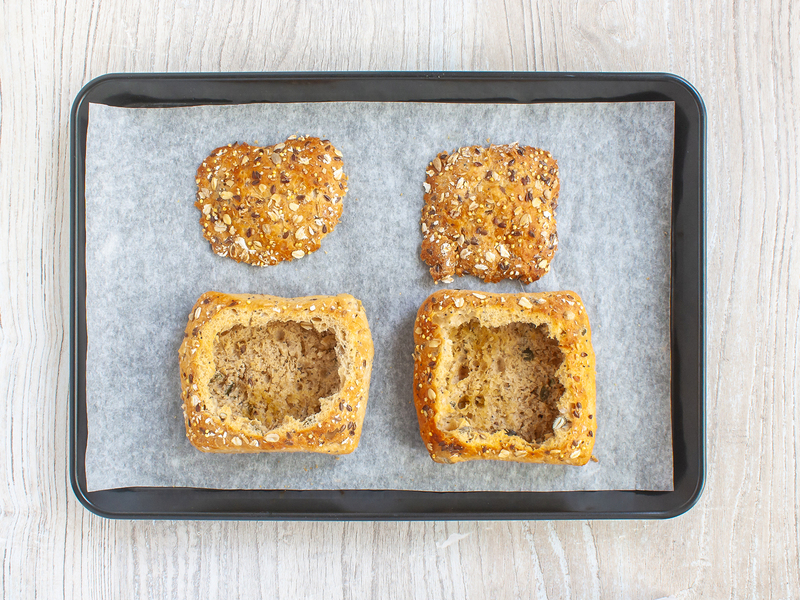 To keep this recipe gluten-free, use wholemeal gluten-free bread rolls, possibly with added seeds for extra flavour. 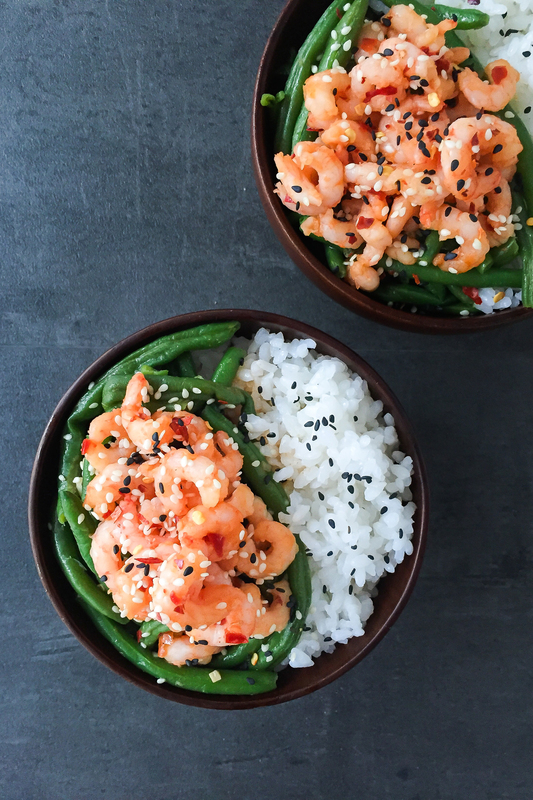 This simple yet satisfying meal is ready in under 30 minutes and makes a hearty dish in under 400kcal, perfect for dinner or your next lunch. 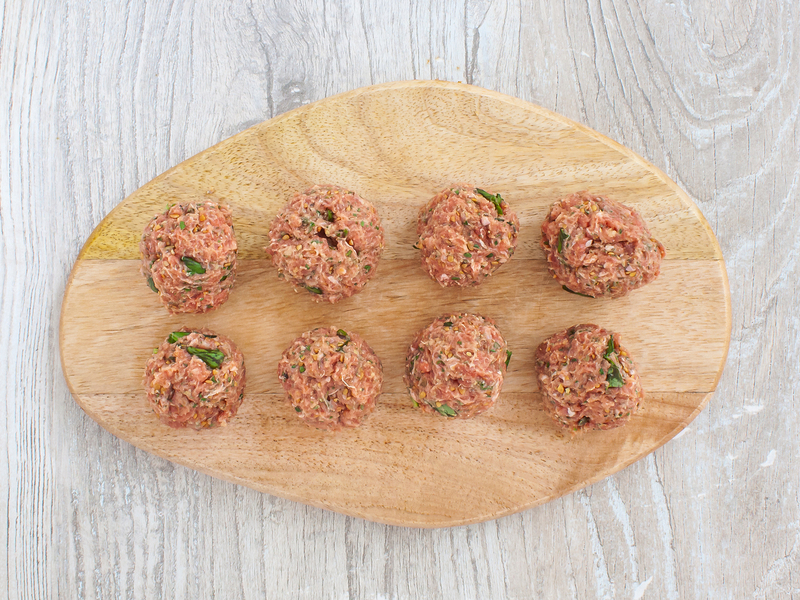 To make the meatballs, use lean beef mince with 5% fat to keep the saturated fats low. As eggs substitute, we have used ground flaxseeds as they thicken up when soaked in water and help to bind the ingredients. They are also a great source of omega-3 fatty acids, protein, and fibre. We have used nutritional yeast to replace the cheese as it’s a delicious superfood with a nutty and salty flavour similar to parmesan. 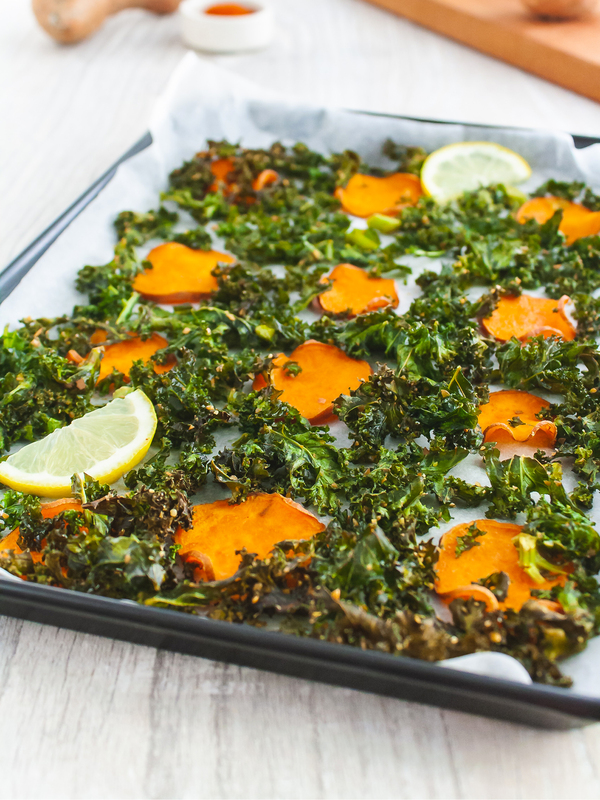 It also provides high amounts of B-group vitamins and trace elements, precious allies to increase your energy levels. The result is healthy and tasty meatballs, high in proteins, healthy fats, fibres, vitamins, and iron. And the best part is that you can eat straight from the bread bowl and, of course, eat that too! 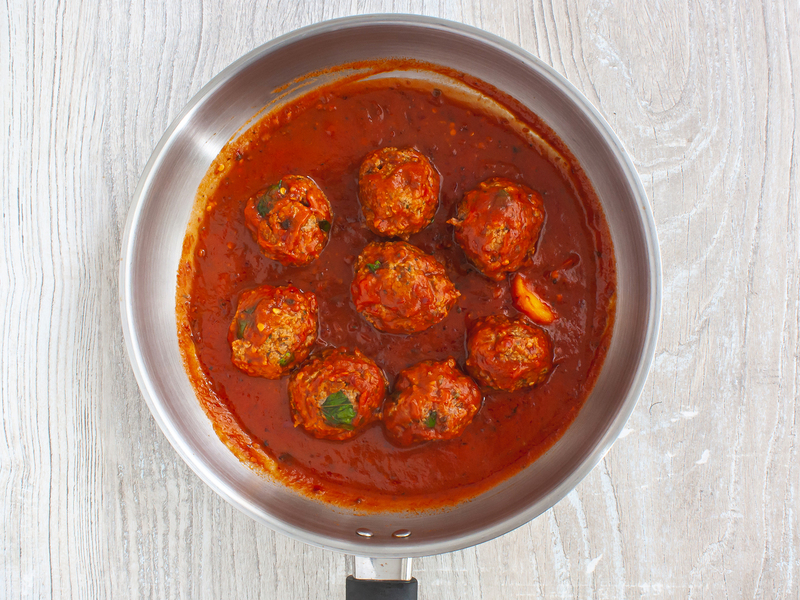 To prepare this healthy meatballs recipe, start by preheating the oven to 200°C (390°F) or 180°C (356°F) for fan ovens. 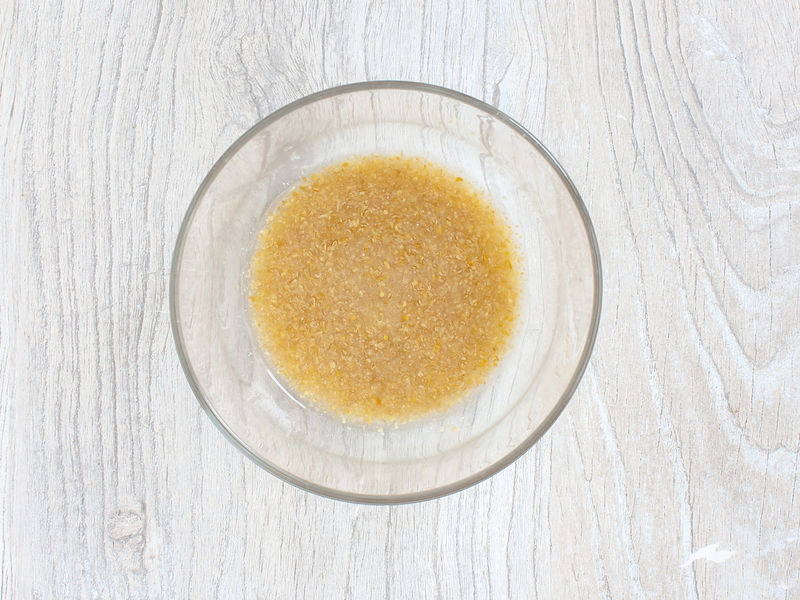 Prepare a flax egg as a replacement to the normal eggs by combining the flaxseeds with 3 tbsp of water. Allow the seeds to thicken up for 5-8 minutes in the fridge (1). In the meantime, cut the top of each gluten-free bread rolls and remove the breadcrumbs carving out a bowl. Save the crumbs for the meatball mix. 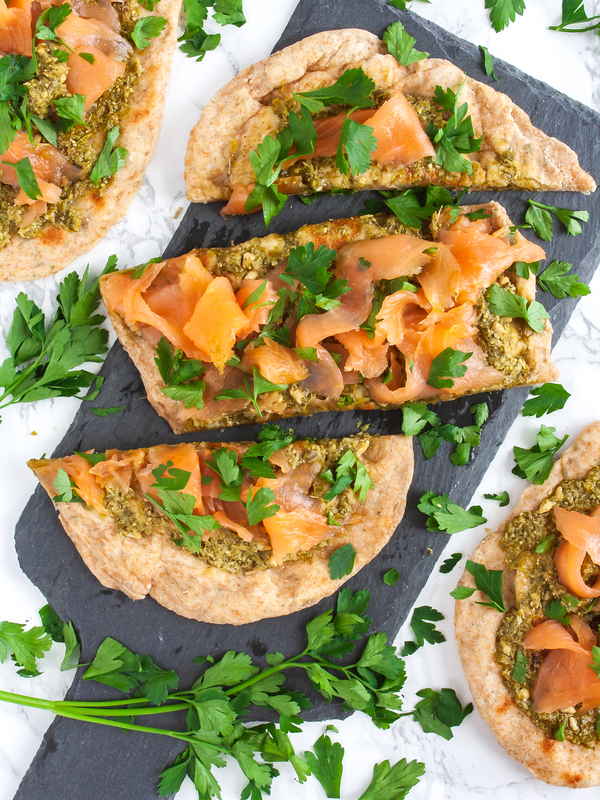 Brush the bread with 0.5 tbsp of olive oil and bake on a tray lined with parchment paper for 8 minutes or until crisp (2). Next, prepare the dairy-free, gluten-free and egg-free meatball mixture. 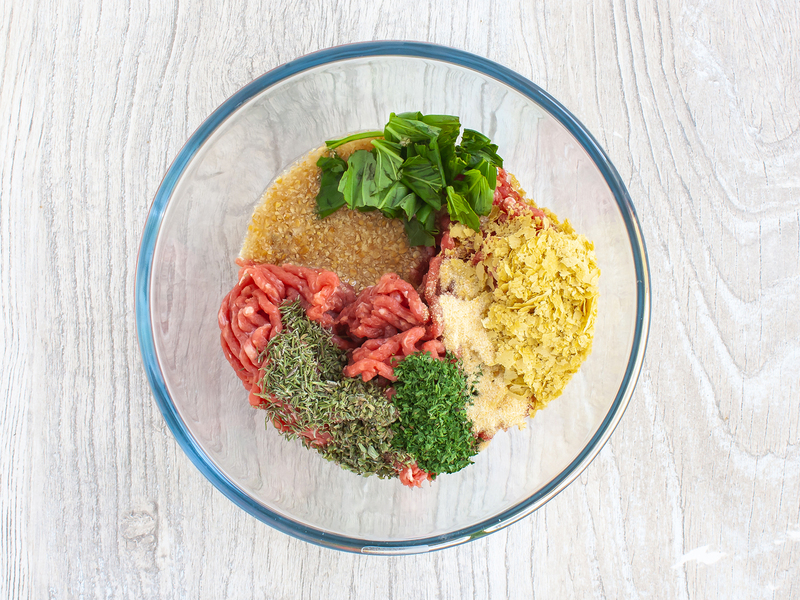 In a mixing bowl, combine the breadcrumbs with 1 tbsp of water and add beef mince, nutritional yeast, thyme, 1 tsp of oregano, parsley, garlic powder, salt, soaked flaxseeds, and chopped fresh basil (1). Work the ingredients with your hands until well combined. Pinch off pieces of mince mix and roll each into a ball over the palm of your hands (2). Dust your hands with a bit of flour if the mixture is too sticky. To prepare the chilli tomato sauce, heat 2 tbsp of olive oil in a saucepan and sizzle the garlic clove until it turns lightly golden. Pour the tomato sauce and add chilli flakes and 1 tsp of oregano. Stir and cook for 3 minutes. Add the meatballs and gently simmer covered for about 10 minutes. Make sure you don&apos;t overcook the meat to avoid tough meatballs. 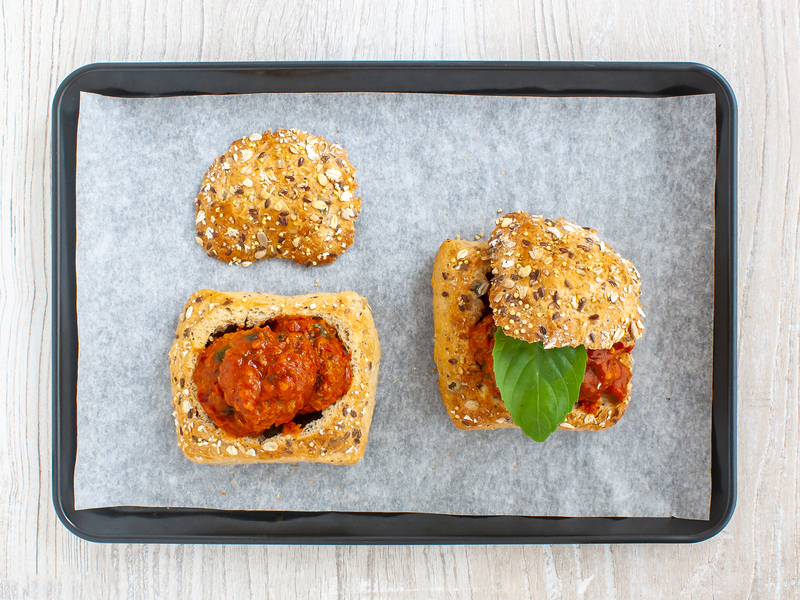 Prepare one bowl of crispy bread per serving by spooning in the tomato sauce and the meatballs. Garnish with fresh basil leaves and cover with the bun top. The bowl will hold the sauce and serve as a plate for the meatballs, so don&apos;t forget to eat that too! Enjoy your healthy meatballs bread boats with a side salad. By baking the bread with brushed olive oil, you&apos;ll have a bread bowl hard enough to hold the meatballs and sauce without becoming soggy.